· Strange Times: Richard III in the 21st Century Book 3. Joan Szechtman. Amazon Digital Services LLC. May 2017. 169 pp. ASIN: B071NMQBJS. Some background history is vital to understanding this account: A famous quote from William Colyngbourne refers to a rat, a cat and a dog who served under a hog. The rat and the cat, Richard Ratcliffe and William Catesby respectively, are dead. The dog refers to the only survivor, Francis Lovell, who survived. This all occurred in the 1480s, and obviously, the hog, Richard III, who supposedly died when defeated by Henry Tudor, has borne a terrible reputation through the centuries. He is labeled a tyrant and a murderer of the Princes of the previous King. However, in the 21st Century, his reputation has undergone a complete revision and now the real Richard III is living in America. In the previous two books in this series, he participated in clearing his name, although there are still descendants who want him captured and killed! Richard now longs to tie up one loose end. Lovell, the dog who was truly a loyal servant to Richard, fought against Henry VII at the famous Battle of Stoke Field. When we meet him, he’s hiding in a basement vault, fearful of capture and death. Richard’s obsession in finding Lovell is understandable and serves as the beginning of this intriguing story. Richard is running for a political office in Oregon but unforeseen circumstances block any further progress in that venture. He and his wife, Sarah, are involved with a company that has built a time machine. This is the story of two figures who accidentally get exchanged in the 15th and 21st Century. Adrian Strange is a colleague who appears to monitor the progress on the time machine; he seems overbearing and suspicious about everything. Because of this machine, he will be transformed in more ways than one although Richard and Sarah will have no idea what Strange is experiencing after he accidentally steps into the active time machine. In trying to get him back, Richard and Sarah wind up bringing Francis Lovell into this future time. What a disaster! Obviously, Richard realizes things must return to the way they were but that plan is not so easily accomplished. The important issue throughout this entire novel concerns what happens when individuals are transported to the past? How much of history can be changed, and should it be changed? Would Francis Lovell have survived? Were the Princes truly killed or did they survive and their descendants as well? How will the past change Adrian Strange if he returns to the present? Joan Szechtman has crafted a story with several mysteries running through the overall plot which keep the reader riveted to the story. 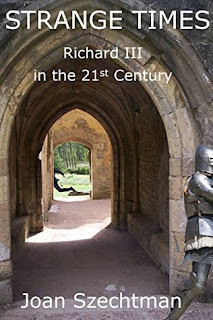 Most knowledgeable readers are rooting for Richard in whatever he plans and does but even the best laid plans go awry. This author clearly knows her topic, with all its twists and turns, and carries the reader through all of them with thrilling skill! Highly recommended historical fiction! Reviewing books is one way of treasuring and developing the craft of great writing! I began avidly reading at a very young age and began my reviewing life with special interest in Arthurian literature. That's the background of my reviewer's name, Viviane Crystal! I now review all genres with equal passion, with a special affection for historical fiction! I'm a proud mother and grandmother, have a Bachelor and Master’s Degree in English education, have been a High School English Teacher for many years and have also earned a Paralegal Certificate. During my teaching career, I created and directed a Writing Across the Curriculum Center. I now work in a legal office and teach in the evenings. In my free time, I love reading, taking early or late-day walks along the ocean shore near my home, listening to all types of music, going to art museums and concerts or just enjoying a cup of coffee in a (where else? *grin*) bookstore alone or with friends. I am absolutely passionate about quality writing or in meeting a new challenge, whether that be working to teach better, write a better review, or helping someone else to discover his or her gift of creative, purposeful expression.